The Asure ID Card Personalization Software platform is used in over 15,000 organizations worldwide to issue identification cards for hundreds of thousands of employees, contractors, club members and site visitors. With the Asure ID Software Development Kit (SDK), OEM vendors and developers can integrate the software's photo ID card design, data entry, technology card encoding and even card printing capabilities into virtually any credential management system. Now end users of physical and logical access control and other enterprise systems can take advantage of Asure ID's streamlined card design and encoding functionality. iDIRECTOR® - Ensures secure development and deployment, manages card memory, and encodes multiple smart card applications in a single pass. iCLASS SE® Open Encoder Platform Support - Allows users to create, encode (read/write), and manage physical access control solution (PACS) credentials on-site in a single step, streamlining your ordering, inventory management, and issuance processes. Integration to the FARGO® LE Laser Engraver - Using Asure ID, print, encode, engrave and laminate your secure credentials within a single, unified card template, saving you critical production and delivery time. Graphical Interface - An enhanced user experience minimizes training and support. Intuitive Toolbar - Clearly positions frequently used elements into logical order, based on the familiar Microsoft® “ribbon” look-and-feel. Pop-out Control Palettes - Reveal color and attribute tools only when needed. 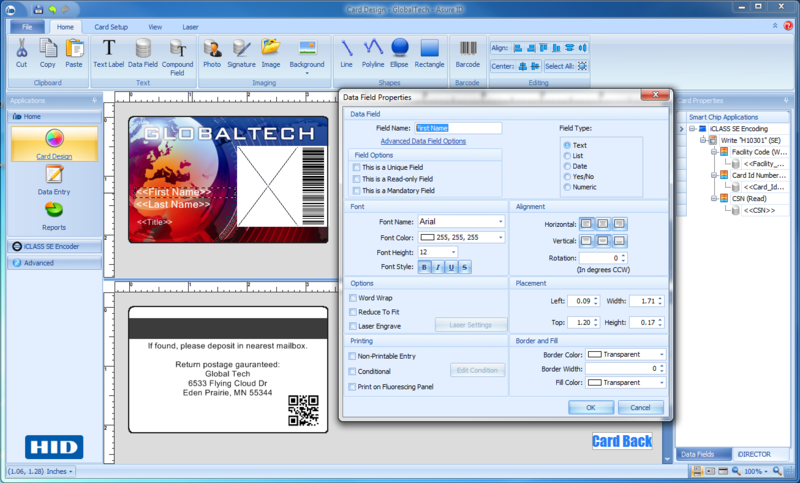 WYSIWYG Display - Helps ensure card accuracy prior to printing. Simplified Licensing - Developers Edition enables integrators to extend Asure ID functionality to their end users.